NASA scientists have published the first research paper based on the initial findings from New Horizons' Pluto flyby, revealing some surprising facts beyond giving us the first detailed images of the dwarf planet and its moons. The research paper has been published in the journal Science, revealing that Pluto and its moons have both very recent geological activity as well as surface features that seem to have been there since the very early stages of our solar system. "The Pluto system surprised us in many ways, most notably teaching us that small planets can remain active billions of years after their formation," said Alan Stern, the principal investigator for the New Horizons mission. And considering the team was expecting a long-dead, cratered mass like our moon, Stern says, "We were also taught important lessons by the degree of geological complexity that both Pluto and its large moon Charon display." For Pluto, the team was able to confirm within a 4 kilometer margin of error that the planet has a mean radius of 1187 kilometers, making it slightly larger than what was expected and featuring mountains with possible water-ice bedrock, craters, evidence for a water-ice rich crust, icy plains and areas that look more like dragon scales than geology. Some craters measure up to a startling 260km in diameter, while others have broken down or been filled with materials, like nitrogen ice. But Pluto isn't completely pock-marked with craters. For example, the Sputnik Planum is free of craters and instead is a relative smooth plain made of ice. The varying number of craters and its locations indicates that the planet actually has different surfaces that are aged differently, as cratered areas indicate that the surface is older as the crust hasn't been resurfaced because of recent tectonic activity. "The diverse geology and apparent recent activity raise fundamental questions about how small planetary bodies remain active many billions of years after formation," NASA said. "The research suggests that other large worlds in the Kuiper belt -- such as Eris, Makemake, and Haumea - could also have similarly complex histories that rival those of terrestrial planets such as Mars and Earth." 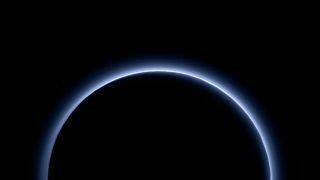 Pluto is also colorful, as shown by New Horizon's images, with colors ranging from deep red, white and pinkish red - and, it was discovered that Pluto even has a hazy blue atmosphere, kind of like Earth but only visible during sunset and sunrise. The research paper also focuses on the discoveries made about Pluto's moons, including the colorful Charon moon. While all of this gives a much better insight into the dwarf planet and its moons sitting on the outer reaches of our solar system, there is still about 90% of data still to be sent back to Earth from New Horizons - so expect a lot more interesting finds to appear in the coming months. "The New Horizons mission completes our initial reconnaissance of the solar system, giving humanity our first look at this fascinating world and its system of moons," said Jim Green, NASA's director of planetary science. "New Horizons is not only writing the textbook on the Pluto system, it's serving to inspire current and future generations to keep exploring - to keep searching for what's beyond the next hill."